Eco-friendly removable wallpaper for those who just can't commit! (3BL Media) April 11, 2012 – Who doesn’t have a love-hate relationship with wallpaper? It’s beautiful to look at in the store and on the wall, but if you’ve ever dedicated a month or more of your life to its removal, you know where the “hate” part comes in. Fortunately, our latest Greenspiration Home American Made Pick-of-the-Week, removable wallpaper from Wallcandy® Art, may help you resolve some of your wallpaper issues. 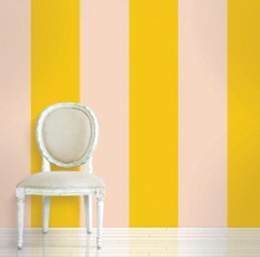 We loved this bold stripe for a dramatic entry hall, or even a singular wall treatment in just about any room. And why not be bold? After all, like all Wallcandy Art’s decals, chalkboard papers, and wallpaper, it is totally removable and reusable. The products, which are non-VOC, non-phthalate, and lead-free, are perfect for children’s rooms, as well as for those of us who are just plain commitment-phobes. All of Wallcandy Art products are produced in their facility in Virginia. The design ideas come from company owner and creator, Allison Krongard, who finds inspiration from everything from fashion to pop culture. She collaborates with a team of artists to transform her inspired visions into practical, do-it-yourself home décor. Once a design and production is set up, the company can print and ship an individual product in as little as 8 working days. If you haven’t been able to reconcile your own needs for instant gratification with your desire to be environmentally and socially conscious, this is the wall covering choice for you. Along with producing a safe and recyclable product, Allison has positioned the company as a source of community outreach. The company has donated hundreds of wallpaper and decal kits to numerous organizations, including the Ovarian Cancer Research Fund, children’s hospitals, schools, community centers and more. “We especially enjoyed working with an organization called Art Aids Art to help decorate homes and community centers in Africa,” said Allison. They had us at removable wallpaper and American made. But this level of outreach made us total fans.